GenHotel is a part of Koole & Liebregts B.V. and is an internethotel where holstein breeders from around the world gather news and trade genetics. What is going on in GenHotel? This virtual hotel has a newspage, with news that members supply and updates in general from the world of Holstein breeding. Auctions are regularly organized for calves (GenHotel Selection Sale) and embryos (GenHotel Embryo Sale). On these auctions, only genetics from members of GenHotel is being offered. Breeders rent a room to promote their genetics and business by giving information on their herd and by showing their cows (donors) with pedigrees and photos. Besides that you will find lists with the highest genomic donors from Europe and further information about for example the most used sire-of-sons. Up-to-date: the genomics on your site are always up-to-date and as a member you can list and rank your animals by RZG, GTPI and NVI. Facility: GenHotel keeps your room up-to-date; it is easy to promote and market your genetics. For GOLD MEMBERS a membership is €750,- per year which allows you to put as many donors on GenHotel as you wish and you will get an unlimited number of newsfacts published on the website. You pay 10% commission on calves and embryos sold on the different auctions with a minimum of €75 per embryo sold. For SILVER MEMBERS a membership is €375,- per year with 5 donors on display and a maximum of 4 newsfacts published on the website per year. You pay 10% commission on embryos sold through the Embryo Sale (with a minimum of € 75,- per embryo sold) and 15% on heifers/cows sold through the Selection Sale. 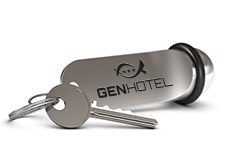 How to reserve your room in GenHotel? Please contact Martijn van der Boom (tel +31(0)624217748) or fill in the contactform on this website.